Creams made with live bacteria are the latest trend, but can they solve complexion problems? Feel like the skin care aisle at the pharmacy just isn’t overwhelming enough? Never fear! There’s a whole new section of creams and lotions to figure out: probiotic skin care products. So what’s the scoop on this latest trend? You’ve likely heard of oral probiotics, the good-for-you bacteria found in supplements, gummy candies and yogurt. In our guts, a balanced community of bacteria aids digestion and helps us fight illness. Can probiotic skin creams offer similar benefits for your complexion? Dermatologist Shilpi Khetarpal, MD, weighs in on what probiotic skin care products can do for you. Bacterial balance: What do probiotics do? Your skin is a crowded place. “Over a thousand species of bacteria live on the surface of our skin,” Dr. Khetarpal says. Don’t squirm. The skin microbiome, as it’s known, is a good thing. “Those bacteria are essential to fight infection, protect against environmental damage, regulate pH levels and keep the skin hydrated and healthy,” she adds. Unfortunately, plenty of things can throw the bacterial balance off. Soaps, face scrubs and medications like antibiotics can tip the scales in favor of harmful bacteria. If you experience any of those skin woes, probiotic creams might help. New skin care products aim to restore balance to your skin bacteria in a couple of ways. Probiotic creams contain live cultures of good bacteria. Others, called prebiotics, contain ingredients that fuel the growth of the helpful germs that already live on your skin. If you’ve got skin that’s naturally glowing and happy, you don’t need to add an extra step (and extra cost) to your skin care routine. But if you have skin problems such as acne, eczema, rosacea or dryness, it’s worth considering, says Dr. Khetarpal. Probiotic products probably won’t solve these skin issues completely, she adds. “There are likely several factors that contribute to your symptoms. But an imbalance of the skin’s bacteria might be one piece of the puzzle,” she adds. Unfortunately, you can’t tell which products are well-tested by looking at the labels. Fancy packaging and high price tags don’t necessarily equal more bacteria or better results. Ready to give probiotic skin care a whirl? Your next step is sorting through your options. Only some products on the market have undergone scientific testing, Dr. Khetarpal says. And only a few of those were actually tested on human skin. If researching study results in scientific journals isn’t your idea of fun, your best bet is to talk to a dermatologist about your options. Probiotic products can restore balance to your skin. But it’s a good idea to keep your bacterial pals healthy in the first place. How can you do that? Step away from the cleanser: “Any soap-based cleansers, including products labeled anti-bacterial or anti-acne, will strip skin of its natural bacteria,” Dr. Khetarpal says. Just add water: In the morning, you might skip cleanser altogether and wash with water. With tweaks to your cleansing routine — and maybe a new probiotic product or two — your resident bacteria are likely to find their equilibrium. When it comes to your skin, that’s a beautiful thing. 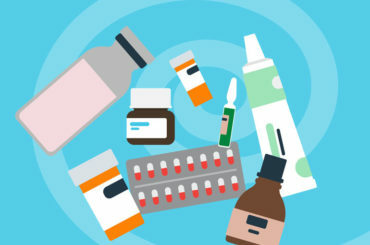 Antibiotics for Acne: How Much Is Too Much? Should I Really Start Giving My 4-Month-Old Baby Peanut Butter?